Back to School Math Mystery: the Case of The School Invaders - 6th Grade Edition. 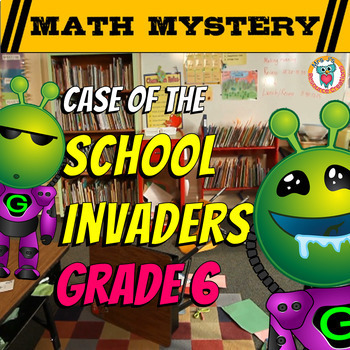 Students must review math skills from the previous grade to help get rid of the stinky, slimy Geometron aliens invading Mathhattan Elementary School! NO PREP, print and go! 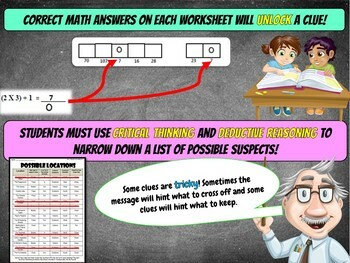 Students must use their math skills to unlock clues. The clues will help them eliminate locations to find where the aliens' transponder is! Optional video hook included for introducing the case! CLICK HERE FOR VIDEO HOOK! - If you would like a set of easier math skills, select a lower grade level version of this mystery. Not sure what a math mystery is? 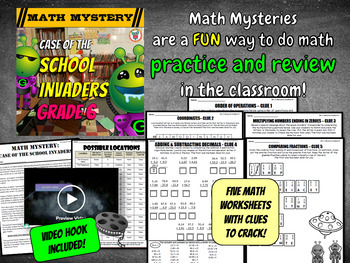 CLICK HERE to watch a video about Math Mysteries or read this blog post: What is a Math Mystery? 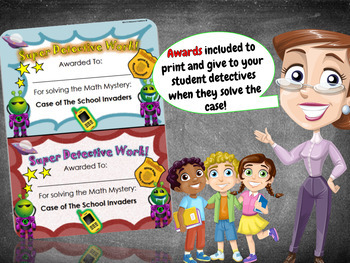 Read Blog Post: FIVE Easy Ways to use Math Mysteries in your Classroom. Browse the range of 6th Grade Math Mysteries HERE.